My first voyage aboard a submarine was an event to remember. I had worked and planned for years, and then finally the time was upon me. My cohorts and I sat for days waiting in a musty hotel room before the orders came allowing us civilians to board. Later, under the cover of darkness, the crew slipped the lines and we headed out from Cape Canaveral into the cold Atlantic for a week-long transit. Like a diver heading out into open water, I was bubbling over with the excitement and anticipation of adventure that lay ahead. This was the second of a new class of nuclear submarines, and my job was to field-test and evaluate some critical systems. My work wouldn’t begin in earnest until the hatches were closed and we slid beneath the waves, but like a diver suiting up for a dive, I busied myself preparing equipment, calibrating monitors, and coordinating with the crew. At first I was too busy to notice, but as we made our way out of the protected waters, we all became aware that we were indeed heading out to sea. Initially, the gentle rocking was welcomed, perhaps even fun. Later it was “interesting,” adding a distinct challenge as I moved from deck to deck and throughout the ship. I quickly learned to widen my stance, balance using my arms and hands, and time my movements to the rhythm of the sea. Unlike a surface ship, a submarine has little to prevent rolling in the seas on the surface, and that rolling motion becomes quite pronounced. Unfortunately, it wouldn’t be until we reached deeper water that we would actually leave the surface. It was amazing how that magnificent warrior — a ship so technologically advanced and capable, so comfortable and nimble beneath the waves — could feel so awkward and clumsy on the surface. Despite the cool atmosphere within the thick steel hull, I was beginning to feel warm, and with no windows from which to view the horizon, my vestibular system was working overtime trying to overpower my visual senses. I wasn’t the only one suffering. One look around at the crew, and it was obvious that many of them were a bit green around the gills as well. A few hours into the voyage, the queasiness became nearly unbearable. With the ship still wallowing in the seas on the surface, I was almost hoping that an enemy ship would target us and put us all out of our misery. Divers are a lot like submarines. Sporting the latest technology, we head out to sea amazingly well adapted to the underwater realm. Our finned feet provide efficient propulsion; our buoyancy can be fine-tuned to hover at most any depth; we’re outfitted with technology designed to illuminate and view the terrain and environment; our air supply is highly reliable, allowing us to remain submerged for an extended period; and we sport high-tech electronics to monitor and record the vital parameters of our “mission.” But when we find ourselves between worlds, floating on the turbulent interface between our terrestrial realm and the solace that lies beneath the sea, we often find ourselves just like that nuclear warrior of the deep, wallowing in a very uncomfortable situation. Unfortunately, our adaptation to the underwater world puts us in a rather awkward position on the surface. While we might be perfectly trimmed to hover or glide at depth, our equipment becomes heavy and bulky at the surface, and we struggle with decided instability. Movement on the surface is equally awkward. The smooth lines and sleek control surfaces on a submarine allow it to move easily through the water when submerged, but at the surface it leaves a drag-producing wake, and must slow its progress to a relative crawl. Likewise, divers often find that while they can move easily beneath the surface, slogging along at the surface takes more energy and is less efficient. In the old days, diesel-electric submarines would surface regularly to breathe in fresh air through their snorkel and recharge their batteries, conserving resources for the time when underwater travel was most strategically important. Even today, the Navy’s nuclear submarines that are finely tuned to operate underwater find themselves on the surface at regular intervals, not only to enter and leave port, but to take care of important business at sea. Sometimes, like a submarine sailing to or from port, we may find ourselves making a surface swim to a particular site in order to conserve air and maximize our time on a particular underwater feature, like a reef or wreck. And just as submarines find cause to surface, many other circumstances place us at the surface both during and after a dive. Submarines surface for a number of reasons. While modern navigation is remarkable, and sophisticated sonar systems serve as finely tuned eyes and ears, communication can still be limited in the underwater realm, and naval submarines must occasionally surface to send and receive messages. Their mission may also require them to make observations at the surface. Although it may be a last resort, a submarine might surface to deal with some form of emergency that can’t be resolved at depth. Like those well-adapted naval submarines, divers often find a need to poke their heads above the surface as well. Perhaps our navigation has become suspect, and we must surface to get our bearings. Other times it’s a problem that drives divers to the surface — an equipment problem, running low on air, or becoming separated from a buddy. Other common occurrences that keep us in between worlds include waiting for a buddy to enter the water, or waiting for the boarding ladder to clear so we can board the boat. The bottom line is we often find ourselves floating on that awkward interface, and so we need some tools and strategies to make it as comfortable and safe as possible. The first time we find ourselves at the surface is usually right after we take that giant stride off the deck of the boat, but hopefully we don’t make too big a splash. All too often, divers mess up that initial transition to the surface by forgetting the little things, like weight belts, masks, fins, and having their air turned on. And making such mistakes is a whole lot easier than you might expect. A little time spent planning and preparing for our departure from the boat or shore can pay big dividends — even in the short term. For example, by taking the time to defog our masks, we will see a little more clearly both on the surface and below. If we check our gear over, we can avoid hitting the water with faulty or maladjusted equipment. By following a predive equipment check such as the popular “Begin With Review And Friend,” (for buoyancy compensator [BC], weight belt, releases, air supply, and final OK), we can make that initial transition to the surface a whole lot smoother. If you’re diving with a large group, make certain you get a good look at what your buddy is wearing so you can pick him or her out of the crowd. I can’t tell you how many times buddy groups have become scrambled on a dive. Another common mistake is for divers to start swimming for the wrong boat at the end of a dive, so once you’re in the water, take a look at the dive boat and note any distinguishing features that will help identify it from a distance. Although that initial transition to the sea’s surface is important, the transitions to the surface that come during or at the end of the dive can be just as important, and following proper protocol is as important to a diver as it is to a submarine crew. When a submarine comes to the surface, it takes a few precautions to better manage the situation. Before it surfaces, it will “listen and look” for obstacles on the surface that could create a hazard. Approaching closer, the periscope may be used to take stock of the situation, and make certain all is clear. Before surfacing through a layer of ice, the diving planes are tilted up to avoid damage. As divers, we should take precautions before or during the ascent, making certain that obstacles are avoided, that we don’t injure ourselves in the process, and that the surface is “clear” for our arrival. The last thing we need at the end of a dive is to be struggling, and so proper buoyancy control or adjustment at the surface is critical for both a diver and a submarine. A submarine generally has two ways to remove water from its ballast tanks. It will either pump water out of the tanks, or blow it out with pressurized air, adjusting both buoyancy and trim to maximize stability on the surface. Similarly, a diver must inflate his BC to provide buoyancy and reduce the energy needed to maintain a comfortable position on the surface. While the auto-inflator is usually the preferred method, we need to be ready to inflate our BC orally, just in case the pneumatic option is unavailable. Struggling against negative buoyancy is a key ingredient leading to fatigue and panic on the surface. Probably the next order of business, after adjusting buoyancy, is to look around to get our bearings. Hopefully, our buddy is there with us, but making sure everyone has arrived is the first order of business on the surface. A quick 360-degree turn will quickly tell the story, and if anyone is unaccounted for, it may be necessary to duck below the surface to see why. To get oriented, look around for nearby landmarks on the shore. Having the compass handy can be useful in the orientation process. If you’re simply looking for your dive boat, remember that many boats can look alike, so don’t start swimming until you’re sure you know where you’re going. Again, a 360-degree turn can be invaluable. When near the boat and waiting for the boarding area to clear, consider finding and grabbing a drift line to conserve energy and avoid drifting away from the boat. A sure sign that someone has just reached the surface is the snarly hiss of a free-flowing regulator, so check the position of your alternate air source (octopus) regulator, and make certain it is positioned properly. While some divers may feel the urge to take off their masks upon surfacing, a wiser choice might be to keep the mask on to prevent it from becoming lost, to protect the face from annoying splash and spray, or just in case it is necessary to peer back into the depths. Lights and other accessories, if not needed, should be clipped off to D-rings or otherwise secured to prevent their loss. Photo equipment, goodie bags, or other items and accessories can also be clipped off, or placed in the surface float or boat. The position or orientation we assume on the surface can also be important to our comfort. In some cases, particularly if we need or want to watch what’s going on below us, we prefer to be facedown, using a snorkel to conserve the air in our cylinder. Otherwise, it might be more comfortable and helpful to float upright, or to just roll onto our backs and relax. Once you’re settled safely and comfortably on the surface, remember to check the time. After all, the surface interval has started, and even if you use a computer, you may want to keep track of your surface interval for planning your next dive. When it comes to the fins, the best option is usually to keep them on until you’re on your way up the beach or boarding ladder. A diver in the water without fins is about as mobile as free-floating plankton. Communication on the surface can be of prime importance. The first thing we typically do after striding off the deck of a dive boat is to give the divemaster or captain an “OK” signal. But even more important may be the need to communicate with the boat at the end of the dive. Unless we’re pretty close to the boat, or the crew is amazingly attentive, hand signals are going to be pretty much useless. Much more useful for attracting attention are other tools such as a safety sausage, and even those can be difficult to spot in high seas. Another good tool that can be useful in sunny conditions is a signal mirror. Here it’s important that you have some experience. Oftentimes, the first step in communicating with the crew is to attract their attention, and an audible signal may be more effective than a visual one. While a voice may not carry far, a good lung-powered whistle can sometimes be heard for generous distances, and an air-powered whistle such as the Dive Alert™ can extend that range considerably. Additional options are available for signaling that can be highly effective at night. First, a good dive light waving in the direction of the boat is often easily spotted. Shining a dive light onto a safety sausage can also help improve its visibility to the boat crew. A flashing personal strobe, or even a camera flash can be a good signal for drawing attention to your position. If circumstances demand a surface swim, you may find it easier to travel on your back than to plow forward breathing through a snorkel. The one drawback, of course, is seeing where you’re going, but choosing a fixed reference point on the shore, or reading the reciprocal course on your compass will help keep you pointed in the right direction. Along with periodic stops to check your progress, you can usually avoid the problem of bumping into obstacles. My week-long excursion aboard the submarine was certainly an event to remember, although there were parts of it I would just as soon forget. Mercifully, our transit on the surface ended before my will to live had completely ebbed, and as the ship settled to a comfortable depth, I breathed a sigh of relief, and began to enjoy the experience. Whether we’re aboard a submarine, or otherwise equipped to venture into the depths, that transient period when we’re in between worlds can be a “memorable” experience. But with the right strategy, we can navigate the air/water interface with relative comfort and safety. Comfort and safety in the water, whether under the waves or at the surface, starts with the selection of properly fitting equipment. For instance, a too-tight wet suit may restrict your breathing. A buoyancy compensator that’s too small may not provide enough lift, and one that’s too big could hamper your ability to move through the water easily. Your local dive retailer is your best source for equipment, as the staff can help you select gear that’s right for you. Many dive centers even offer customers the opportunity to “test dive” equipment in a pool or at a local dive site. It would seem that once we’ve made it back to the surface at the end of a dive, most of the risk is behind us. Still, many divers will face a variety of physical and psychological hurdles upon reaching the surface. Several factors may tend to heighten the anxiety of a diver at the surface leading to what could be called “surface distress syndrome.” First is the awkward motion, which may be disturbing in itself, making it difficult to complete tasks needed to reach the shore or boat. An overweighted diver, or one who has not properly adjusted his buoyancy, may be struggling to stay afloat. As the diver becomes tired, he or she may be susceptible to panic. Another contributor to the discomfort can be a perceived inability to breathe. 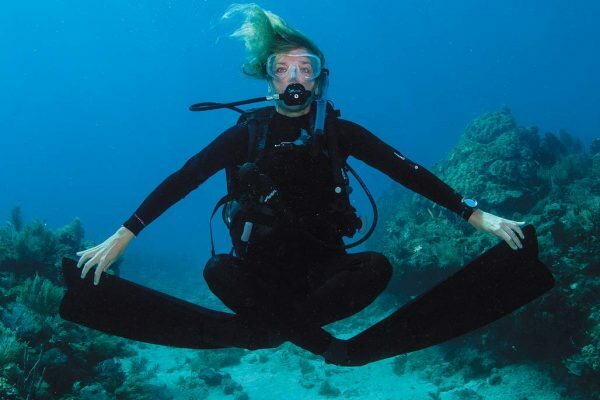 This can be caused by unfamiliarity with breathing through a snorkel, or breathing from one with too much dead space or resistance, or because the buoyancy compensator has been overinflated to the point that it restricts movement of the chest and rib cage. Also compounding the psychological hurdle is that the diver can no longer see what is around him in the water. At this point, it’s easy to imagine a variety of sharp-toothed denizens of the deep circling for an attack. Finally, divers can succumb to a sensation that they are floating away from the boat — which they may in fact be. Several simple steps can help ease the tension that divers feel at the surface. The first is to properly adjust the buoyancy — enough to float comfortably, but not so much that you can’t breathe. Then relax. If the water motion is uncomfortable, fix your sight on the horizon to limit the conflict between visual and vestibular sensations that bring about seasickness. If breathing through a snorkel is uncomfortable, lean back, dispense with the snorkel and breathe normally, using caution not to take in any seawater. Take deep breaths, and then exhale slowly. Relax. For those whose imaginations tend to run away, it may be helpful to put the face in the water, breathe through the regulator, and look around. Again, try to relax. If the boat has a tag line, grab hold, and wait your turn at the exit. Signal the divemaster, boat crew, or your buddy if immediate assistance is needed.